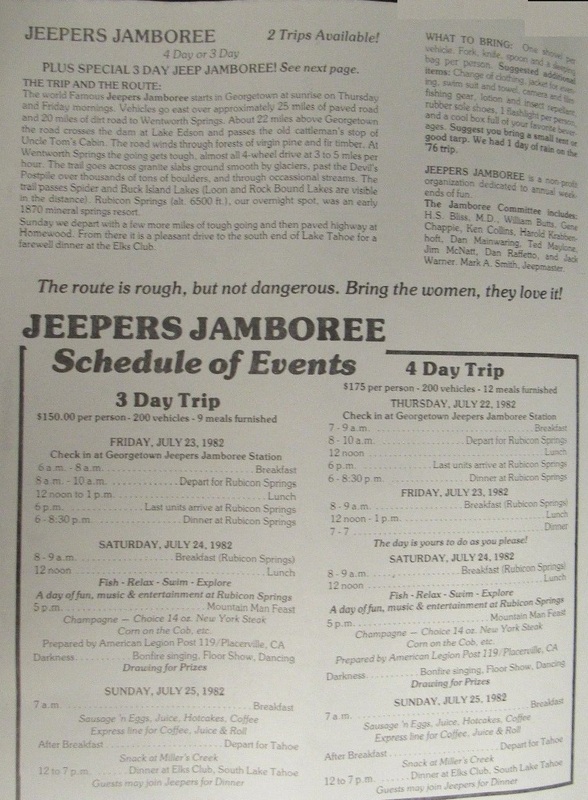 The Jeepers Jamboree is the original and most famous off-road event in the world. 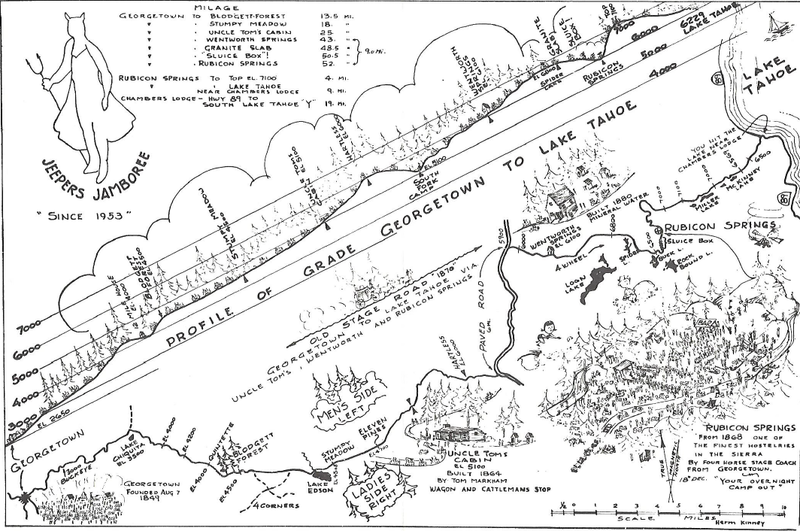 It begins in Georgetown, California, and follows the Rubicon Trail to Rubicon Springs, high in the Sierra Mountains. 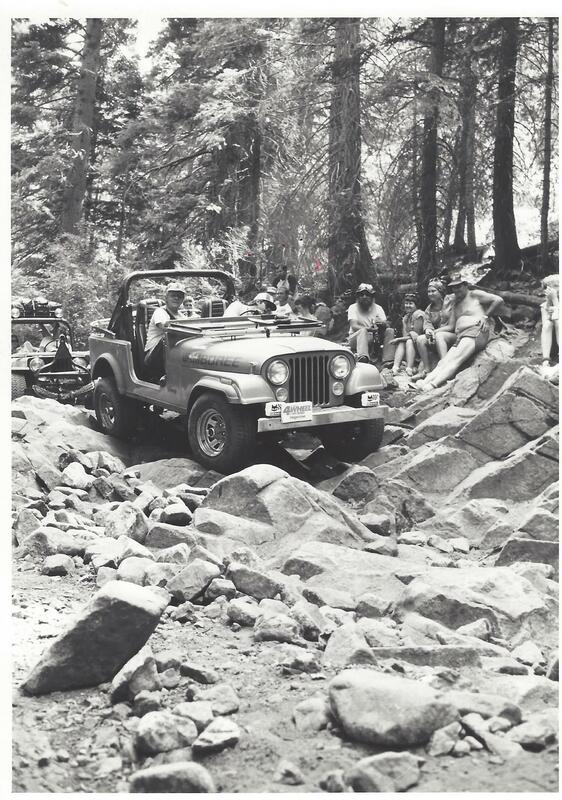 The Rubicon trail is considered to be one of the most difficult off-road trails, rating a 10 out of 10. The Jamboree was started by Mark Smith. 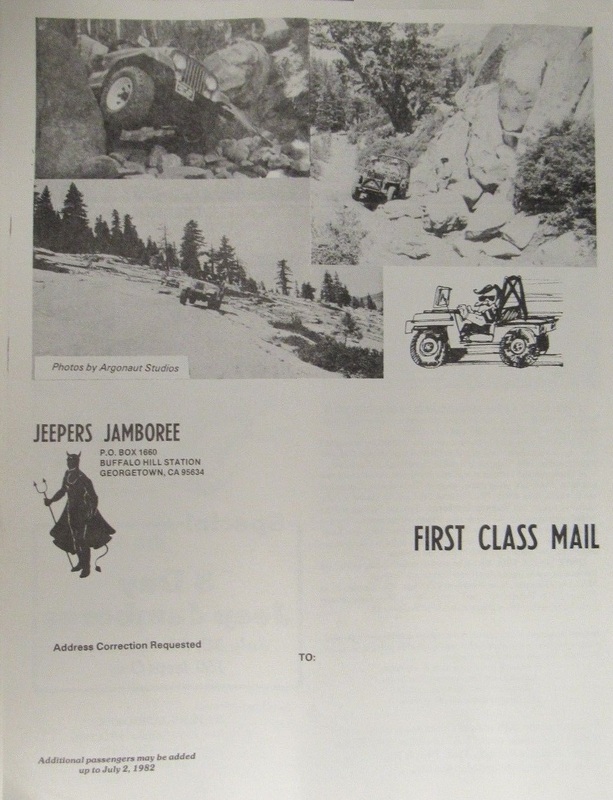 The Jamboree began in 1953 when 55 vehicles made the difficult trek. You can read more about this history of the event here. From those humble beginnings, a legend was born. 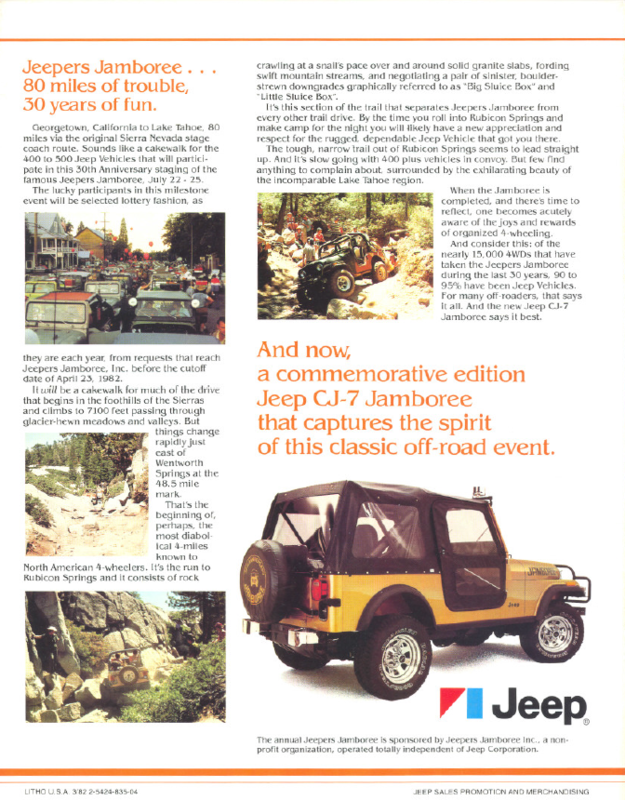 Jeep officially joined the event a few years later. 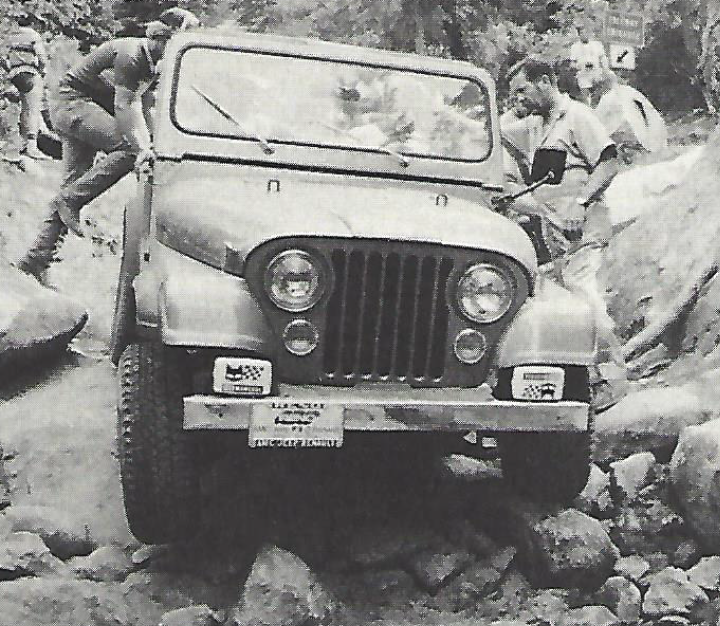 To this day, all new Jeeps must prove themselves on the Rubicon before production. 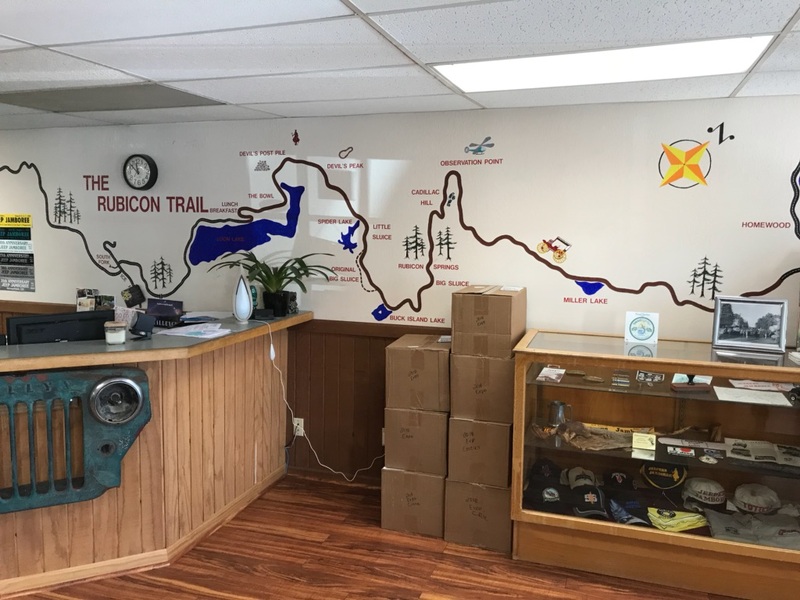 Below is a map of the Rubicon trail. First 30 Years by Peg Presba, 1983. 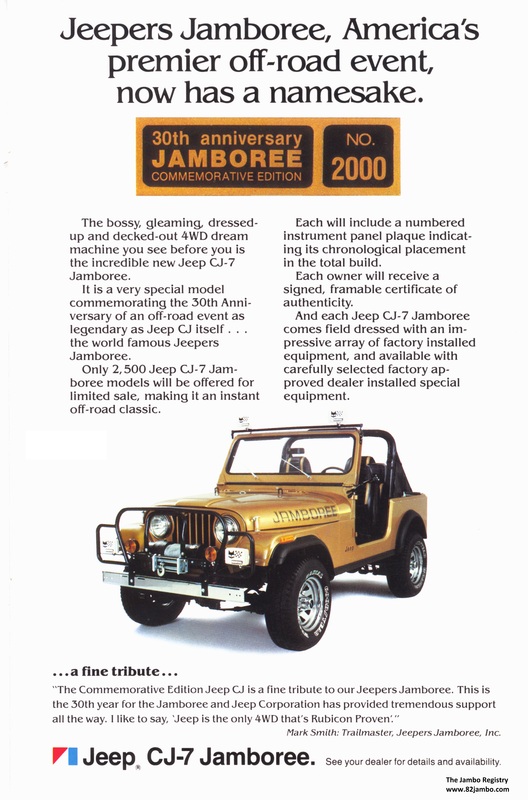 In 1982, Jeep decided to commemorate the 30th Anniversary of the first Jeepers Jamboree by creating the CJ-7 Jamboree Commemorative Edition. As detailed here, the Jambo was outfitted with special Topaz Gold Metallic paint and a special numbered plaque on the instrument panel. This was no Laredo! 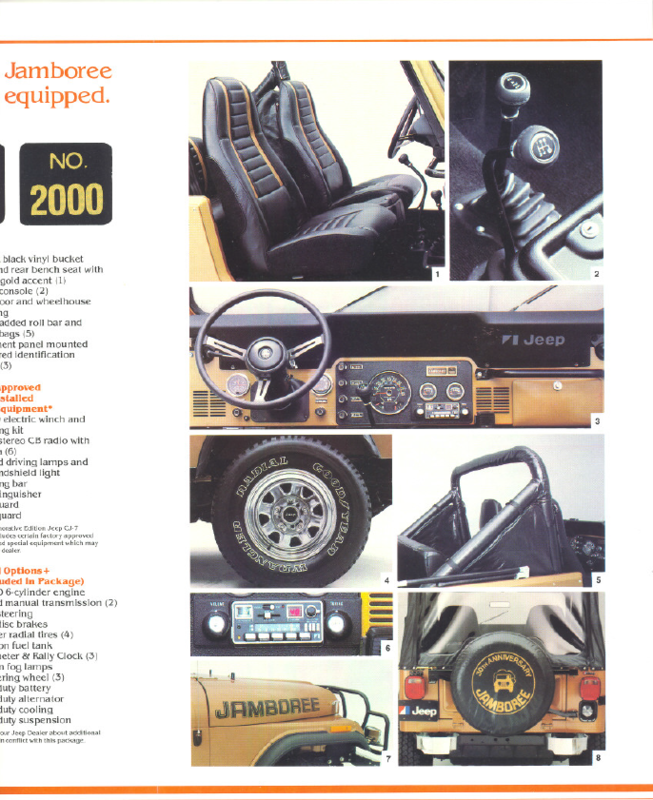 The Jambo was the Rubicon of its day, with lots of optional equipment designed for off-road use. 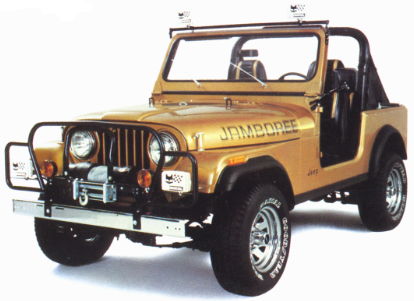 This included an AM/FM/CB (to this day, most jamborees require participants to have a CB installed in their vehicle), saddle bags, a Ramsey 2001 8000-lb electric winch, brush/grille guard, and light bar. The Jambo came standard with very cool Marchal 850 fogs lights and stone covers. 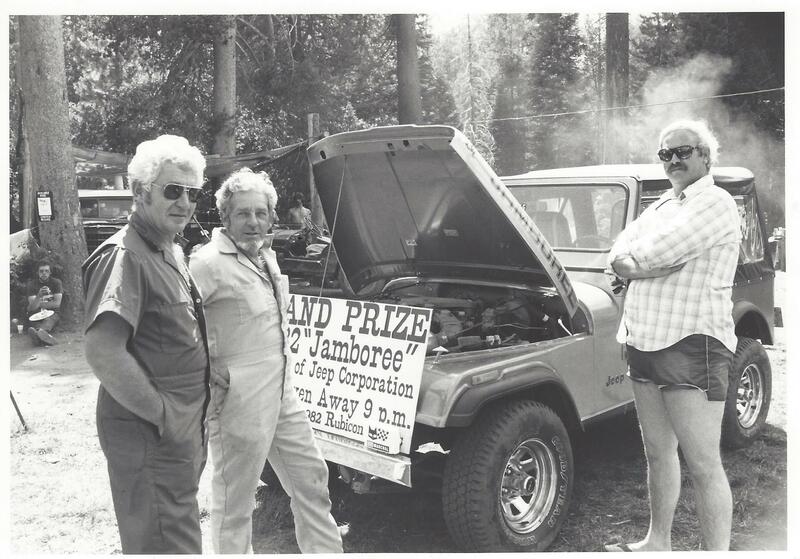 Jeep executives attended the 1982 Jeepers Jamboree and brought several Jambos along for the trek. 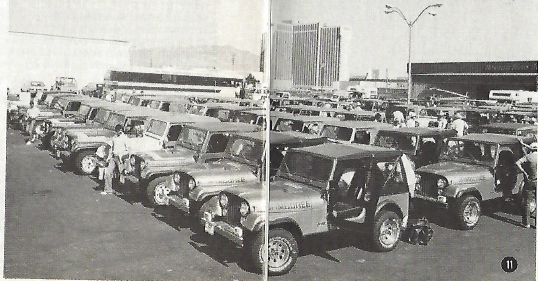 In total, Jeep sent 65 new CJ-7s to the 1982 event. At least six of these were Jambos (see below)! 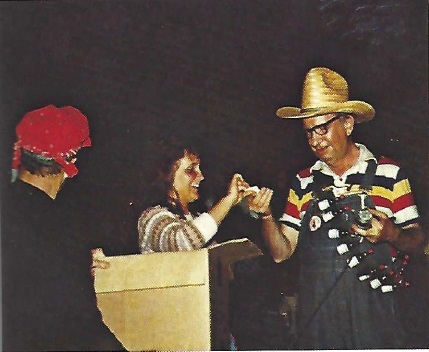 On Saturday, July 24, 1982, they also gave away the Jambo pictured to the right. This Jambo is equipped with Marchal 850 fog lights and stone covers. It does not appear to have a winch or brush/grille guard. This was given away at Rubicon Springs, which means it was driven on the Rubicon to get there. 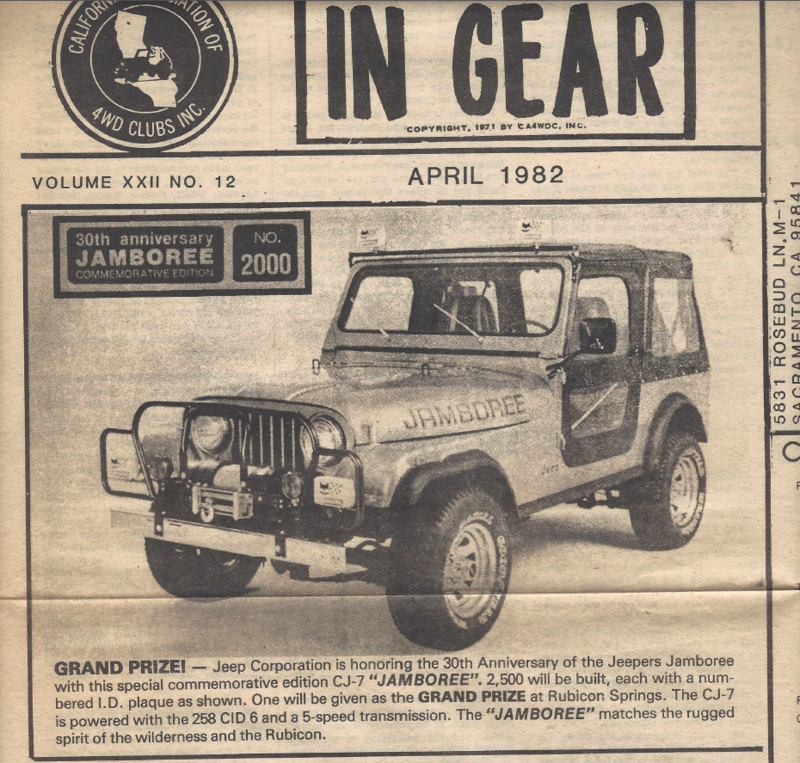 Below is an annoucement in the April 1982 issue of In Gear (CA Association of 4WD Clubs) announcing the Jambo! 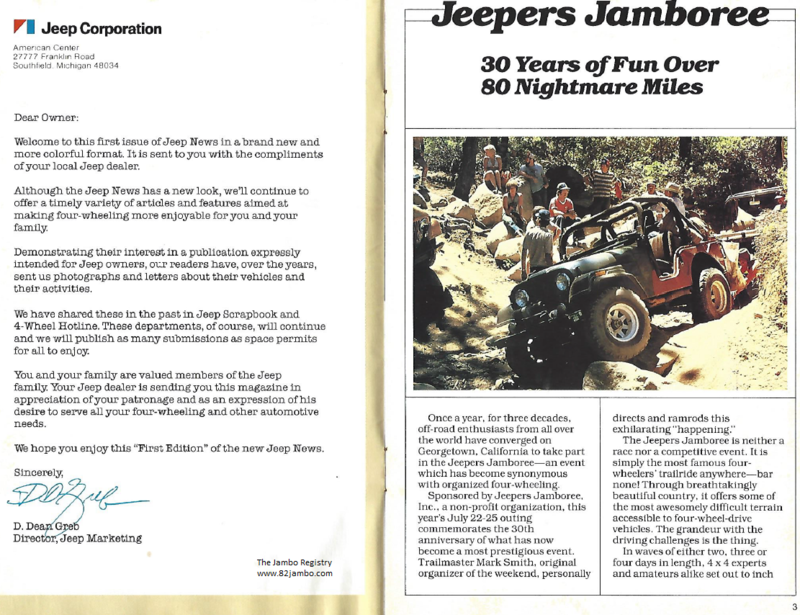 Below are pictures of the mailing that Jeepers Jamboree sent out in 1981 to market the 30th anniversary event in July 1982. You can find a pdf of this document here. 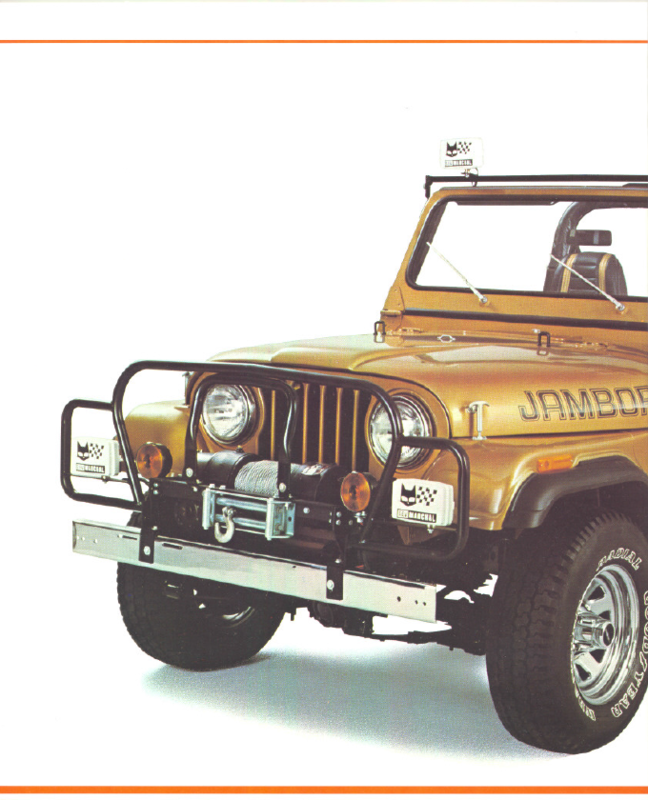 Below is a picture of six Topaz Gold Metallic Jambos and possibly two Olympic White Jambos lined up for the 1982 Jeepers Jamboree. 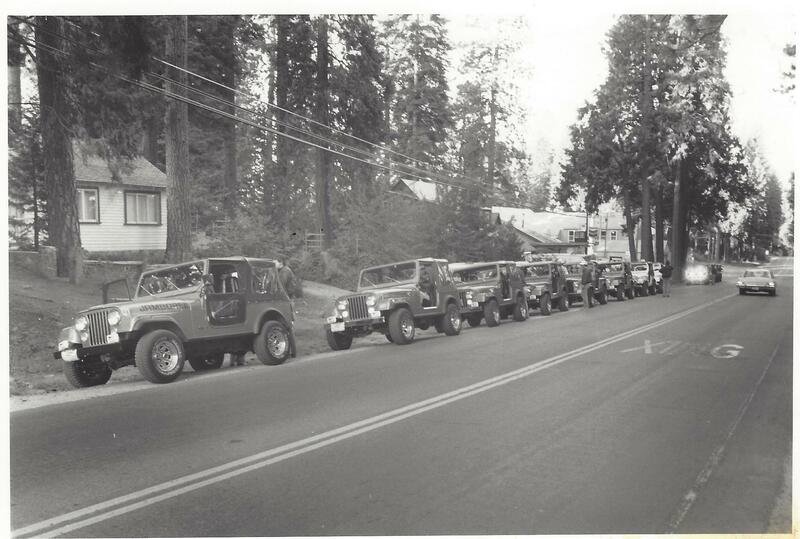 It seems likely that this was a line-up of Jambos and, therefore, the two white Jeeps in the back are, in fact, Jambos. However, neither of them seem to have Marchal fog lights on the bumper, like the Topaz Jambos do. Although, the first white one looks like it has Marchal 859s on a light bar. 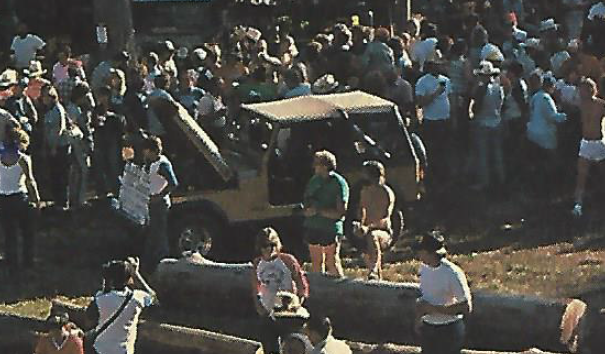 Below is a color photo of a Jambo on the Rubicon during the 30th Anniversary event. This is only the second known color photo of a Jambo outside of the showroom! Wow, looks fun! 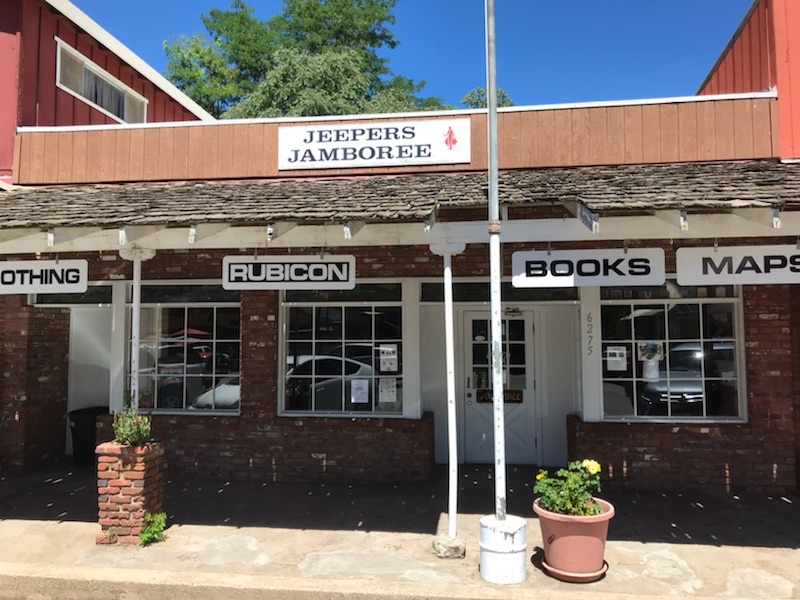 Once everyone made it to Rubicon springs, Jeep gave away a Jambo! Here is a black and white photo showing that Jambo. Check out those black rockers! Also, notice there is no hood insulation. 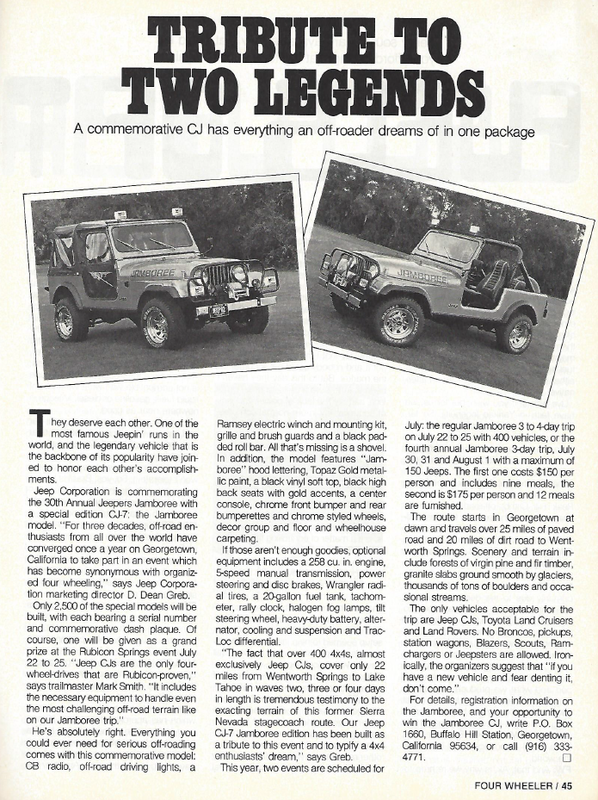 Source: Four-Wheel Offroad, Nov. 1982. Here is a Jambo going through the Sluce Box (notice the Marchal lights and roll bar padding). 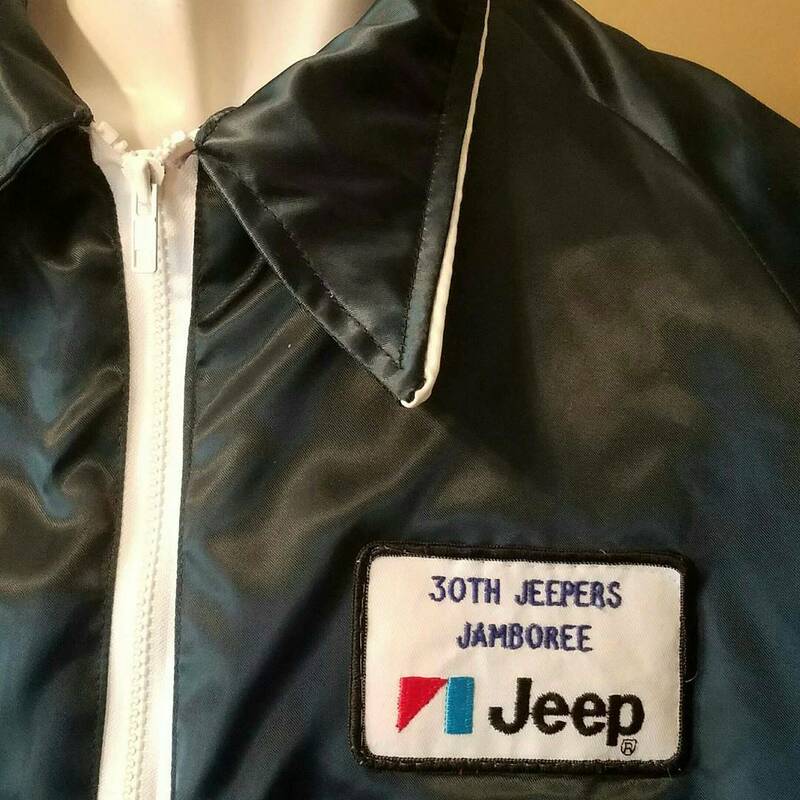 Jeep made a special jacket for the 30th event. 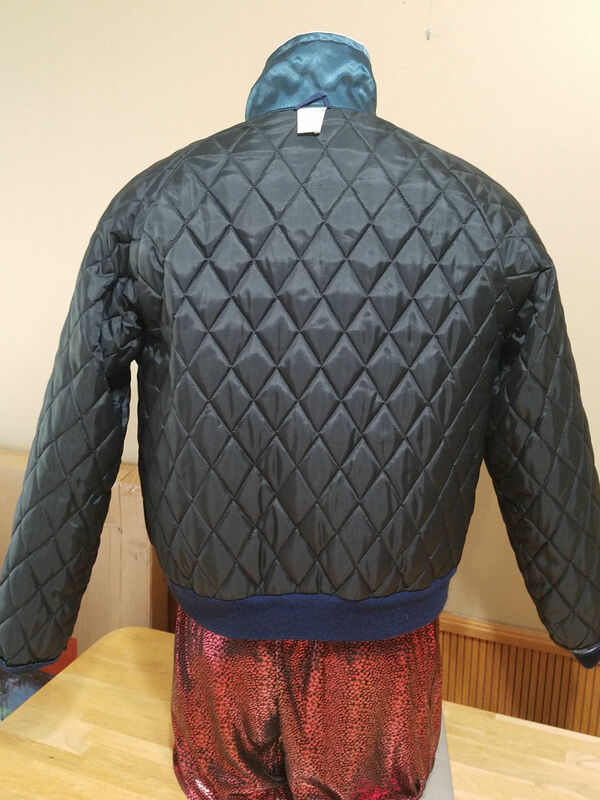 Below are some pictures of the jacket owned by Bickel (#0152). 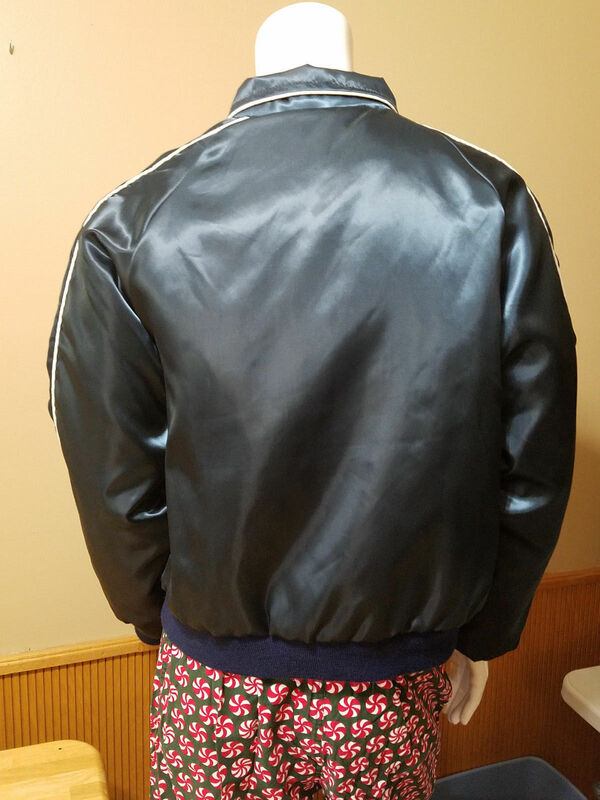 This jacket was found in a thrift store in Detriot. 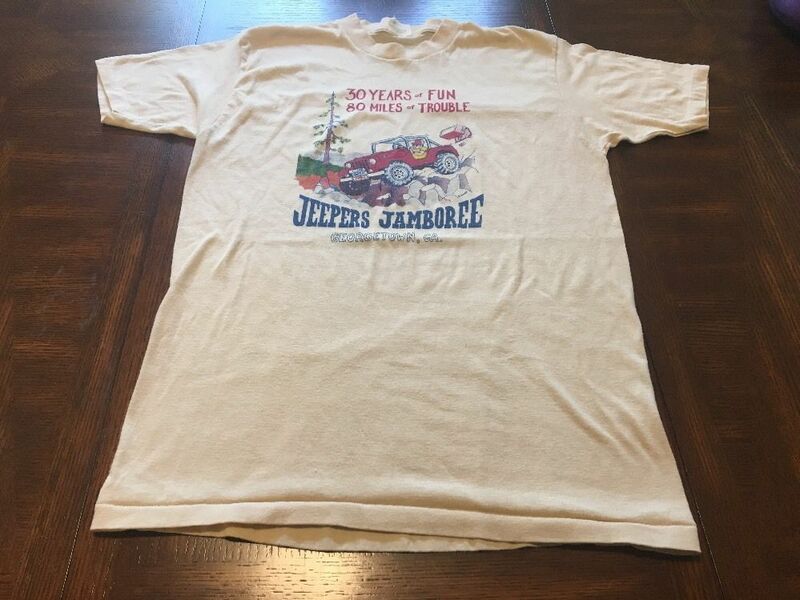 We believe Jeep made these for their executives that were attending the 30th Annual Jeepers Jamboree. Below is a picture of the G-shirt that was sold at the 30th Anniversary event (owned by Bickel, #0152). 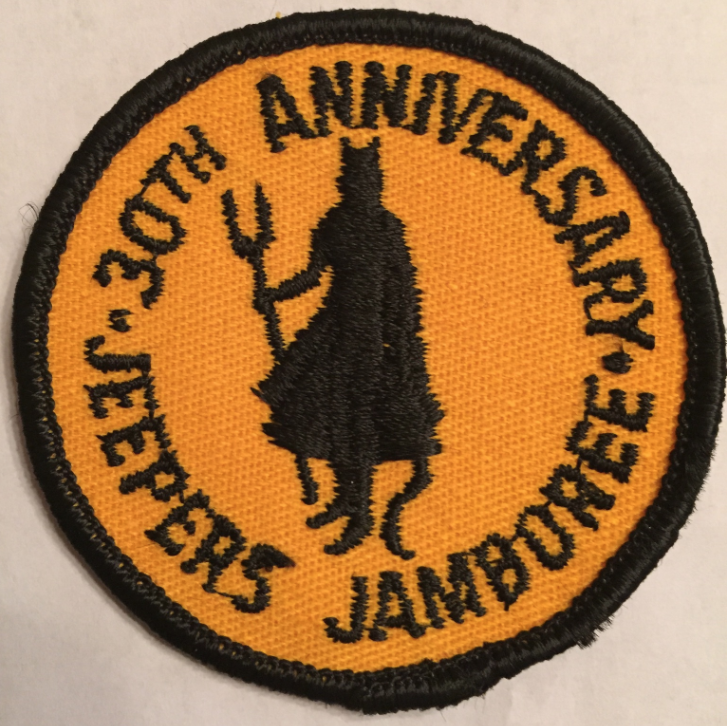 Here is an NOS patch from the 1982 Jeepers Jamboree (owned by Bickel, #0152). They even made numbered commemorative 30th Anniversary belt buckles. 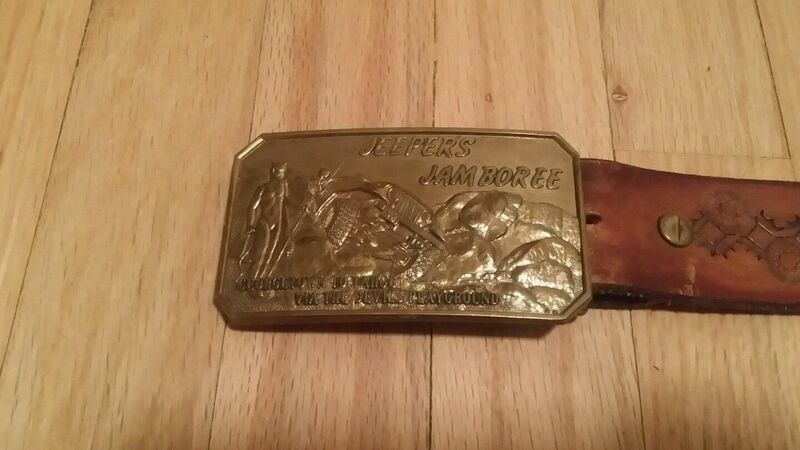 Bickel's (Jambo #0152) Jambo belt buckle (#1759) is below. These are very rare, but we do have one for sale! 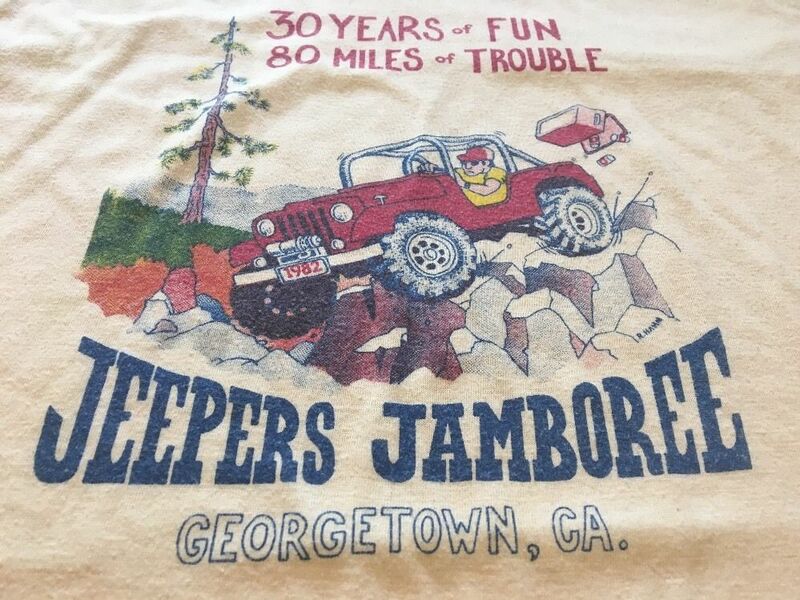 If you have additional information regarding the 30th Anniversary Jeepers Jamboree or the history of the Jambo, please email jambo152@82jambo.com. 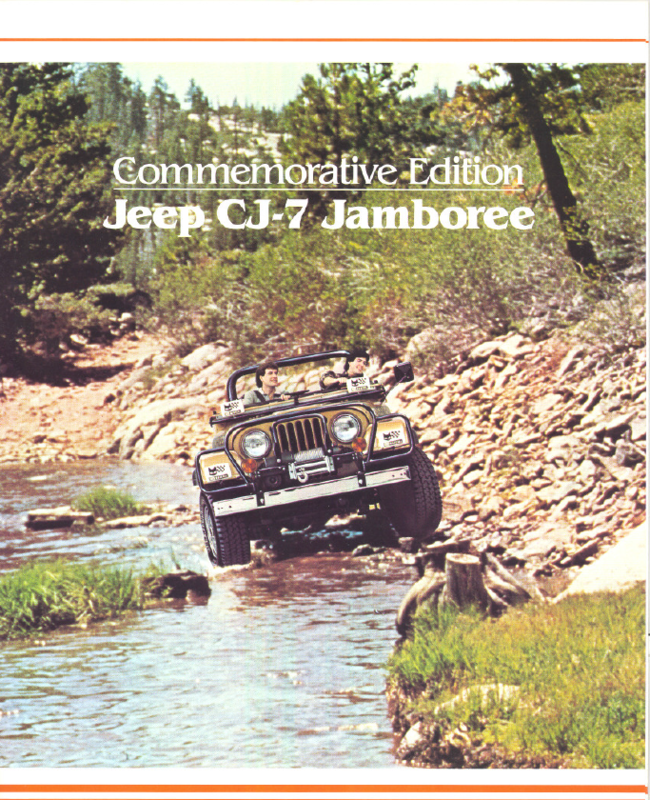 Below is the Jambo sales brochure. Here is a link to a pdf of the file. Here is a nice photo compiled by Heath Aggen (#0180). 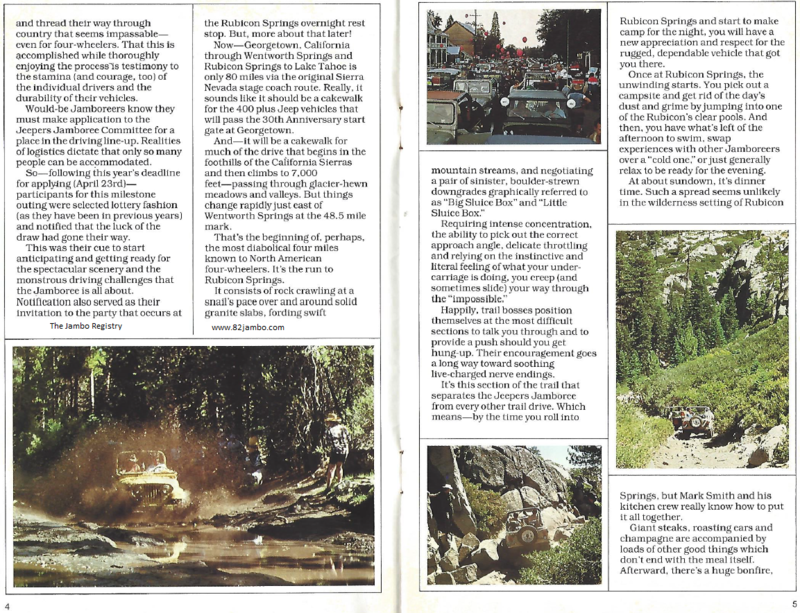 Below are some pictures from the Spring/Summer 1982 edition of Jeep News. A pdf of newsletter is here. 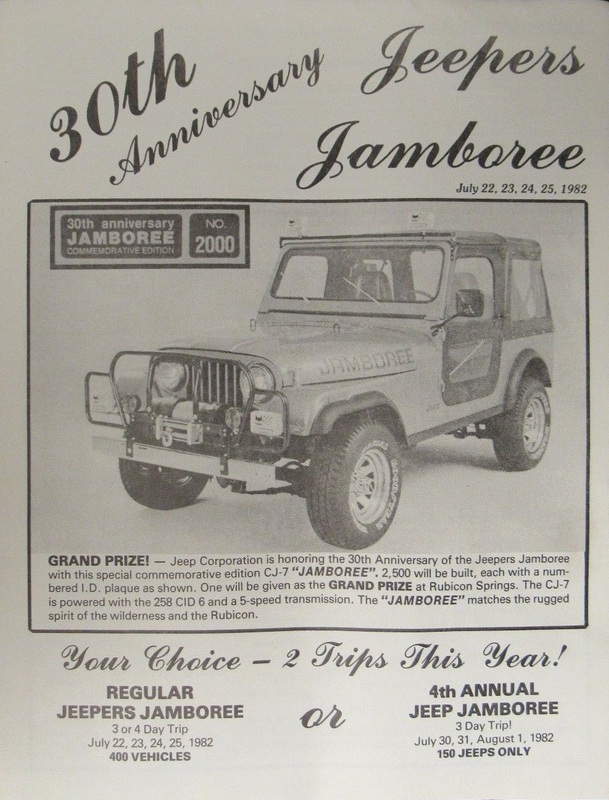 In conjunction with the 1982 Jeepers Jamboree and the launch of the Jambo, Jeep held a sweepstakes for a chance to win a Jambo. The ad is pictured below and available here. 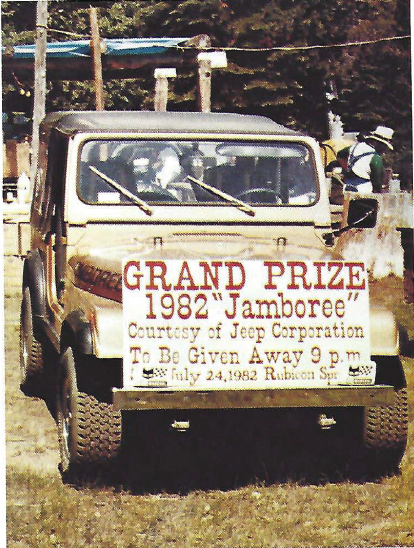 Diana Falcone, of Midland, Texas, won the sweepstakes and drove her prize on the Rubicon during the 1982 Jeepers Jamboree. We do not know the number of the Jambo that she won. 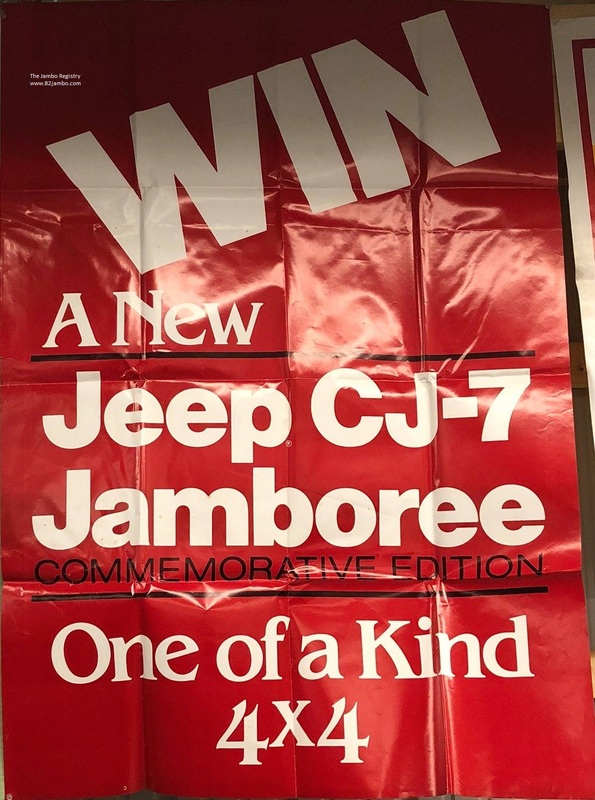 Below is a banner that Jeep dealers had to promote the Jambo and the sweepstakes. 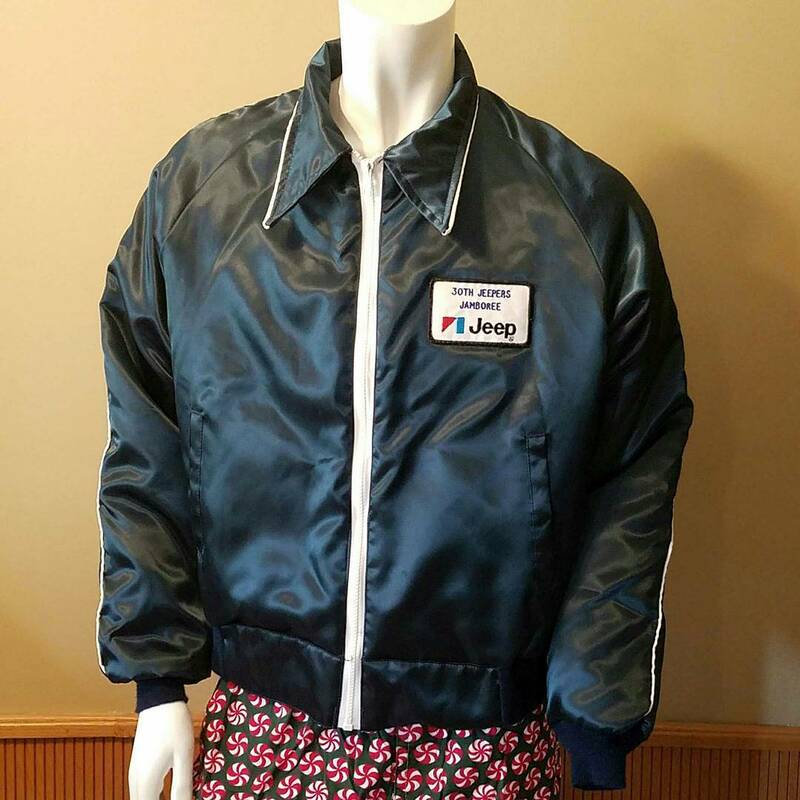 Steve Mandarine found this in an old Jeep dealership. Here is a pdf. 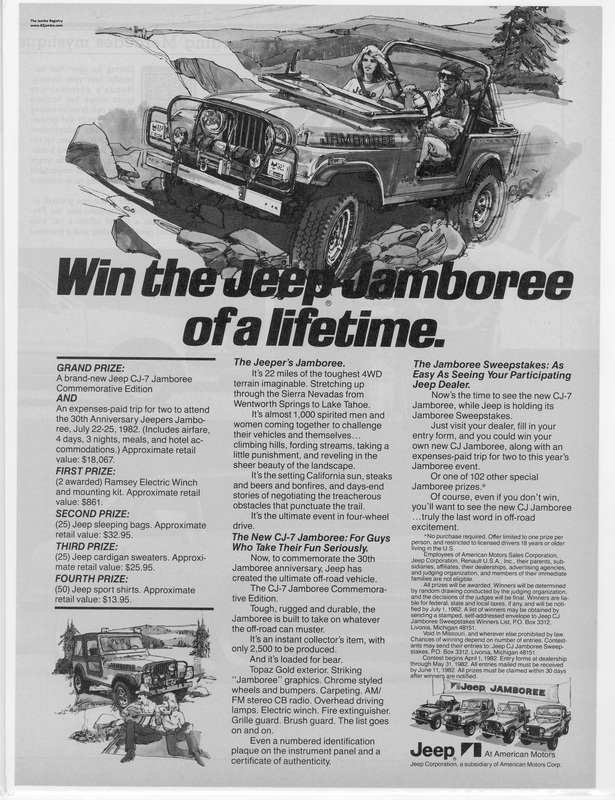 Below is a full page advertisement that Jeep ran promoting the Jambo. It is also available here. 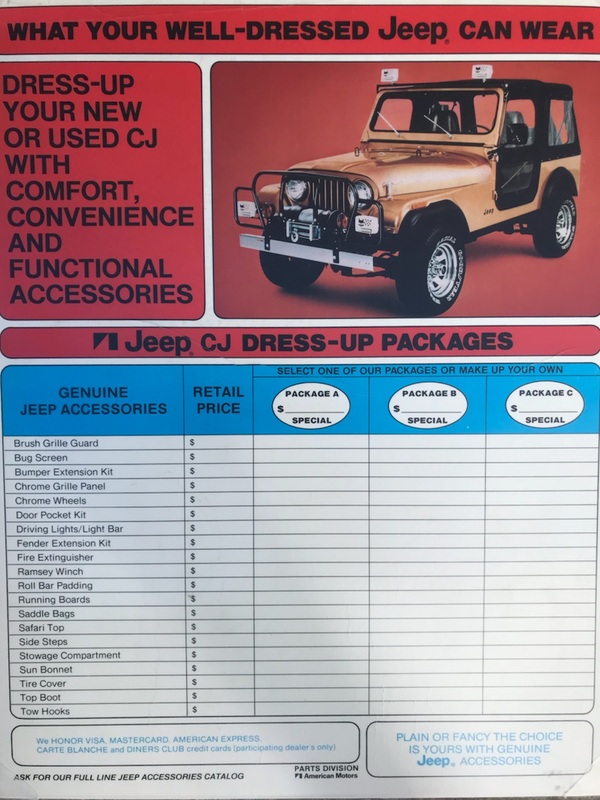 Here is a flyer put together by the Jeep Parts division! 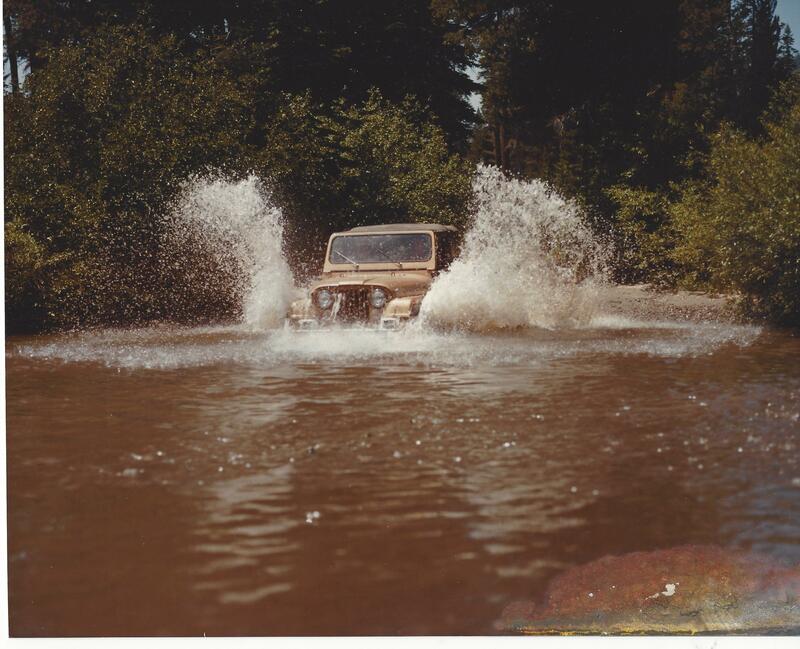 Special thanks to the Jeepers Jamboree for sharing this and to Heath Aggen (#0180) for cleaning the image up! 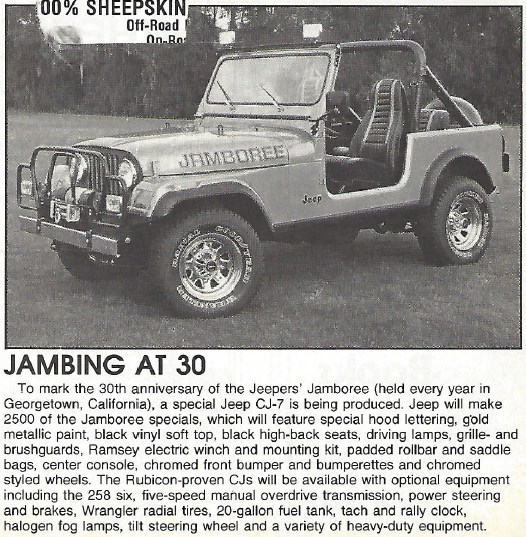 According to this flyer, Jambos could be ordered with the "Jamboree" Package, which included all the dealer installed accessories (Ramsey winch, AM/FM CB with Antenna, Fire Extinguisher, Marchal 859s on light bar, and the brush and grille guards--the Marchal 850s on the bumper were included in the base model). 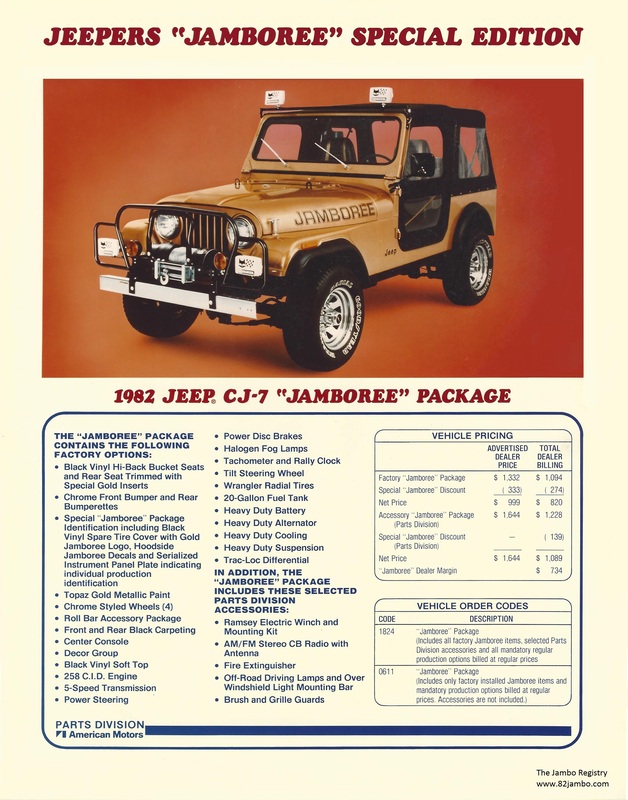 The retail price of the "Jamboree" package was $1,644 (equivalent to about $4,000 today). Dealers made $734 on this sale. Here is a poster based on the Jambo above. 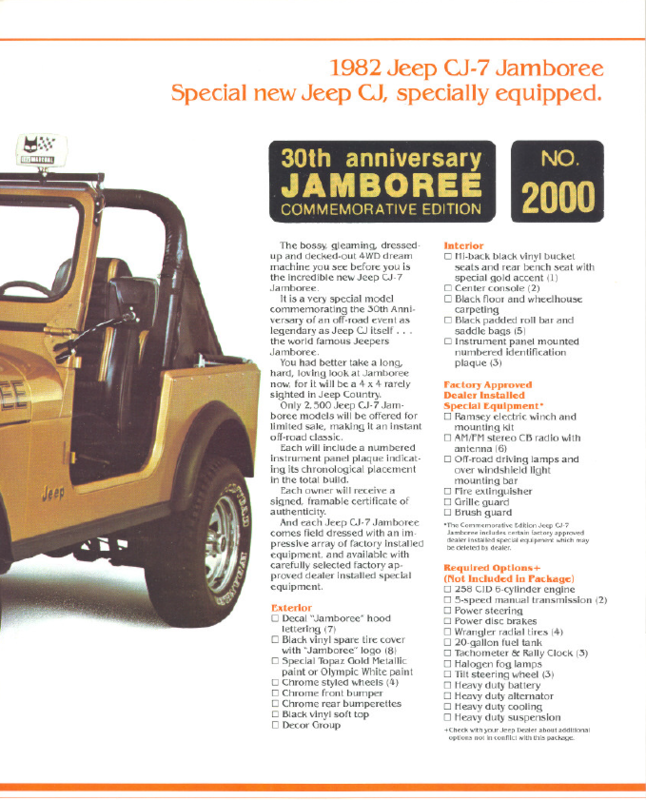 Clearly, the Jambo was a special Jeep that was used heavily to market Jeep accessories. 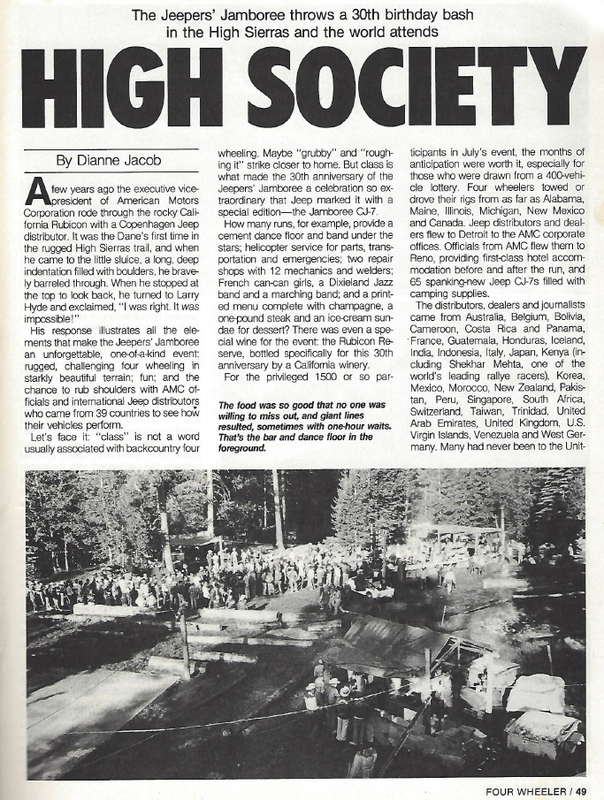 Off-road enthusisits were excited about the Jambo, as shown below in the article by Four Wheeler magaize, published in their June 1982 issue. This Jambo is missing its saddle bags. 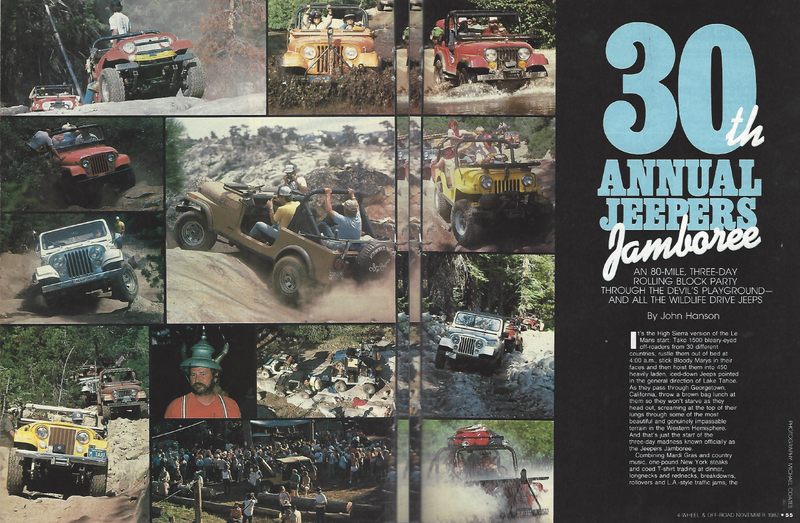 In their November 1982 issue, Four Wheeler featured the 30th Anniversary Jeepers Jamboree. 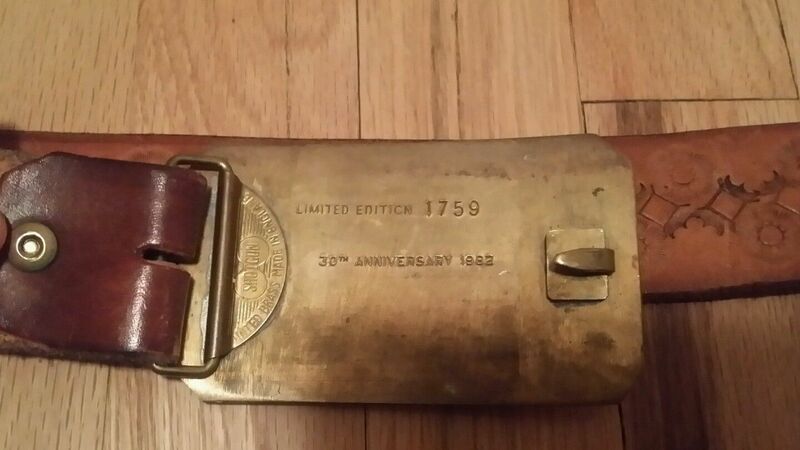 This article mentions that two Jambos were given away as part of the 30th Anniversary and features a picture of a Jambo going through the sluice box, as shown below. Notice that the driver-side Marchal stone cover is upside down. 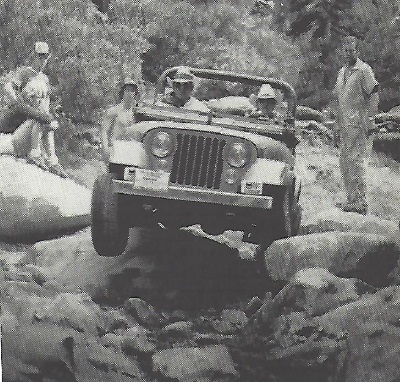 We have another picture below that shows this same Jeep in Reno. 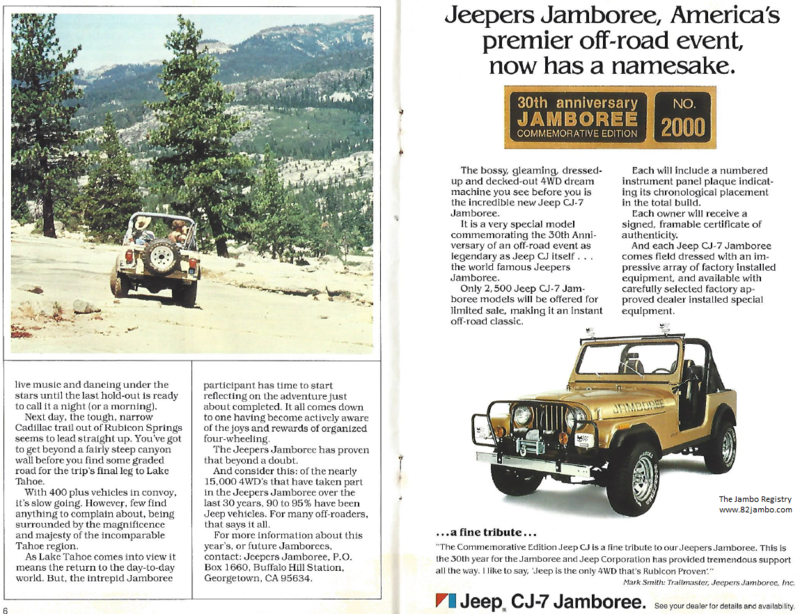 The article also includes a picture of the 65 new CJ-7s that Jeep sent for its employees and dealers to drive on the Rubicon during the 30th Anniversary event. This picture is below. See any Jambos? 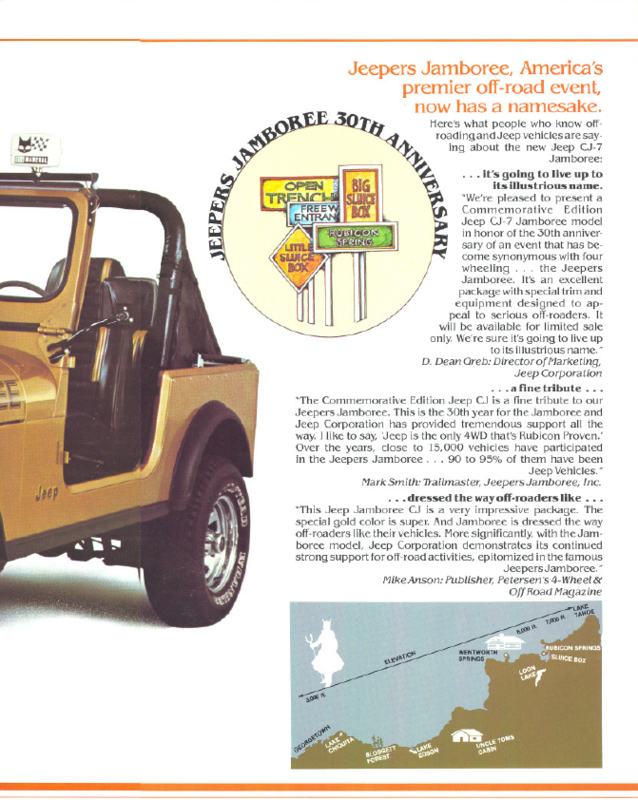 The November 1982 issue of Peterson's 4-Wheel & Off-Road, reported that Jeep provided 70 new CJ-7s for the 30th Anniversary event and included the picture below. You can clearly see three Topaz Gold Metallic Jambos in the foreground. Look at the second Jambo from the right in the front row. If you look closely, or zoom in, you can see that its driver-side Marchal stone cover is upside down, just like the Jambo above. The stone cover was upside down in Reno and nobody noticed all the way up the Rubicon! 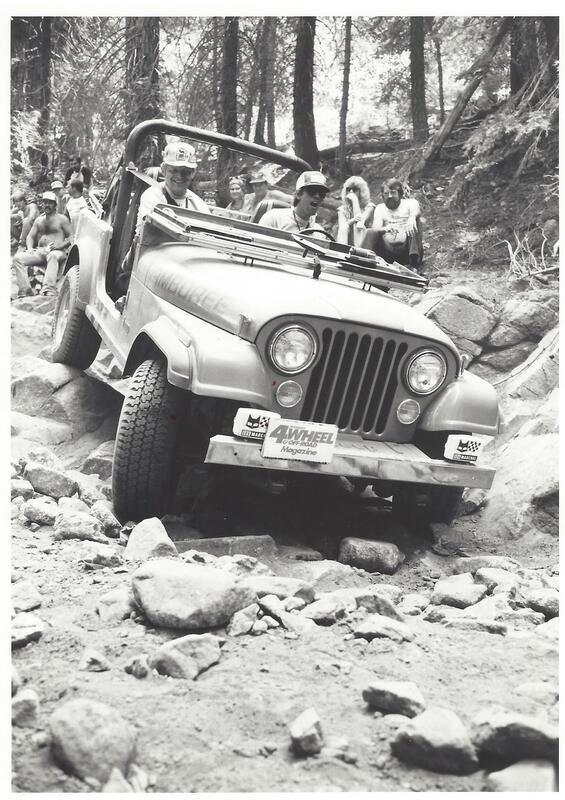 The picture below is from the July 1982 issue of Peterson's 4-Wheel & Off-Road, also featured the Jambo (original article was slightly torn). This is the same Jambo shown above, which is missing its saddle bags. The press was not alone in their enthusiasm for the Jambo. 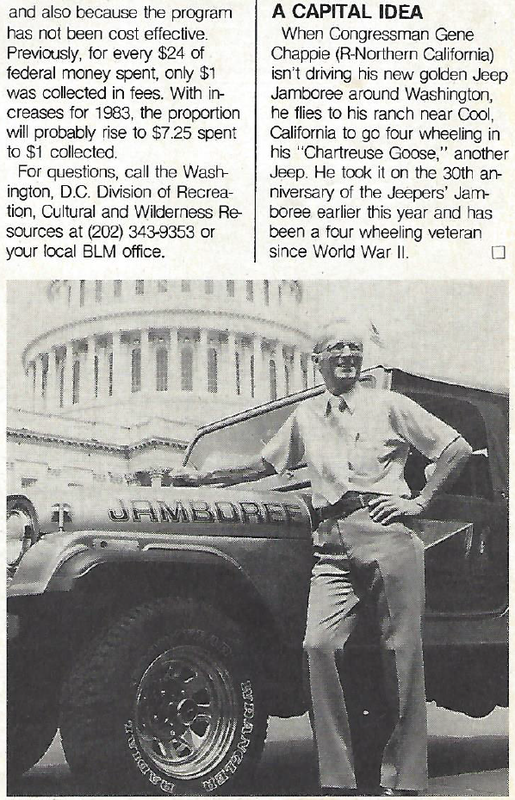 As shown in the picture below (from the December 1982 issue of Four Wheeler), Congressmen Gene Chappie (R, Northern California) owned a Jambo, which he drove around Washington, DC. The Jambo Registry is a trademark of www.82jambo.com.